Chris Brown (right) attends a progress hearing at Los Angeles Superior Court Jan. 15, 2015. Brown was first placed on probation after a 2009 domestic violence case in which he pleaded guilty to assaulting his then-girlfriend, singer Rihanna. Chris Brown’s new year is off to a bumpy start because of his inability to follow directions. On Thursday a Los Angeles County judge revoked his probation stemming from his 2009 Rihanna assault case. Brown’s probation was revoked because he did not receive permission to travel for a concert, and the judge also expressed concern that the singer would not complete his community service on time. According to the Associated Press, Judge James R. Brandlin allowed Brown to remain free until a hearing scheduled for March 20. During that hearing the judge will hear an update from probation officials. In December probation officials warned Brown not to leave Los Angeles County, but he performed at a club in San Jose on Jan. 11 without prior permission for travel. It was during this club appearance that a shooting occurred that left five people injured, and Brandlin wants officials to investigate to make sure Brown wasn’t involved. 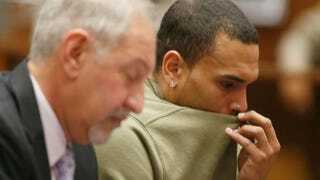 Brown’s attorney Mark Geragos stated that his office was told Brown didn’t need permission to travel. Regarding Brown’s community service, the singer has until the end of January to complete the last 200 of the 1,000 hours he was ordered to perform. However, the judge expressed concern that Brown would fail to complete his service, and factored that concern into his decision to revoke Brown’s probation. In Brown’s probation report, his probation officer wrote about another shooting that occurred at a nightclub where Brown was in attendance, and stated that the singer is showing poor judgment. Over the last two years, Brown has had numerous issues with his probation and run-ins with the law. In 2013 his community-service detail in Virginia was brought under scrutiny after prosecutors questioned if he had actually completed the required hours. Then, in October 2013, Brown attacked a man outside a Washington, D.C., hotel and was hit with a misdemeanor assault charge. He was ordered into rehab by Brandlin but was kicked out in March 2014. Brown was then required to spend two-and-a-half months in jail. Brown, who attended court Thursday with his mother and girlfriend, is pretty lucky the judge didn’t throw him back in jail again.